Elote is the Mexican street corn bursting with flavors of creamy cheese, chili powder, and a hint of lime. For those who love this tasty dish, this is the recipe for you! 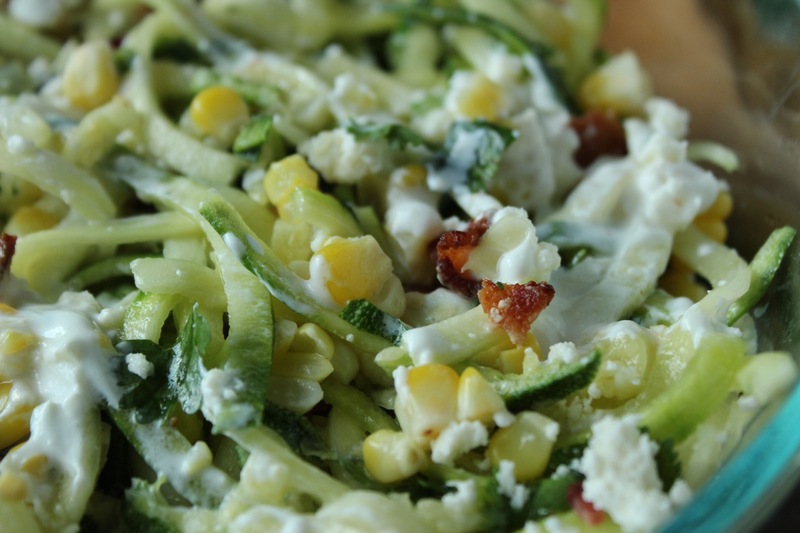 The zucchini noodles are healthy, easy, and many of the ingredients can be made ahead of time. When summer comes calling, I start looking through the storage spaces in my kitchen for my spiralizer. In my opinion, it’s a very underrated kitchen tool because I have never made a meal that I didn’t like using it. In addition to being easy to use, the spiralizer can transform a simple zucchini or sweet potato into an elegant recipe! When I came across this recipe inspired by Cooking Light, I knew I had to try it. Of course their version doesn’t call for bacon, but after reading the recipe, I knew it screamed for it! And believe me, my hubby and I did not complain about the saltiness added by the crispy bacon, and neither will you! Besides the bacon, the best part of this recipe is it calls for ZERO cook time! You heard me, ZERO! The ingredients only need to be prepped and tossed together, hence you can prepare plenty of this dish ahead of time. All prepared ingredients can be stored in the fridge until needed. I did the following ahead of time, so my prep time the night I served this was only 10 minutes! Can’t beat that! Cook the corn – can either boil or grill, then allow to cool and cut off the cob. Cook bacon ahead of time. Elote-style Mexican street corn bursting with flavors of crumbly cheese, chili powder, and a hint of lime. 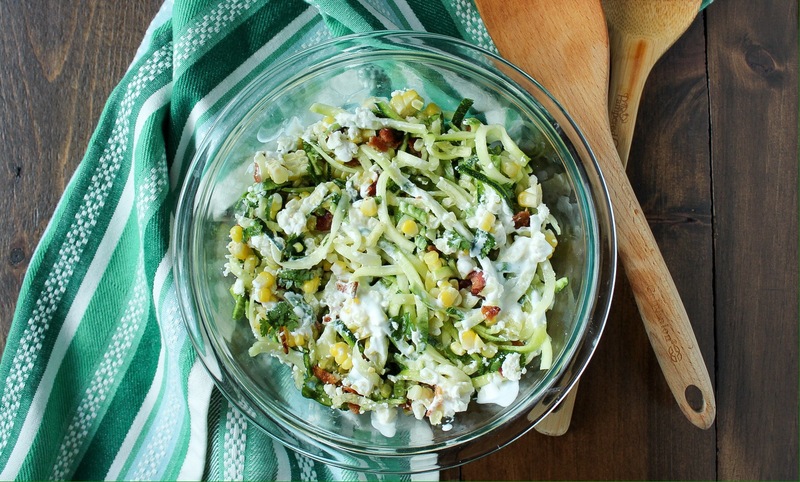 Place first 7 ingredients (corn, cilantro, olive oil, lime juice, salt, bacon, and zucchini) in a large bowl, toss. 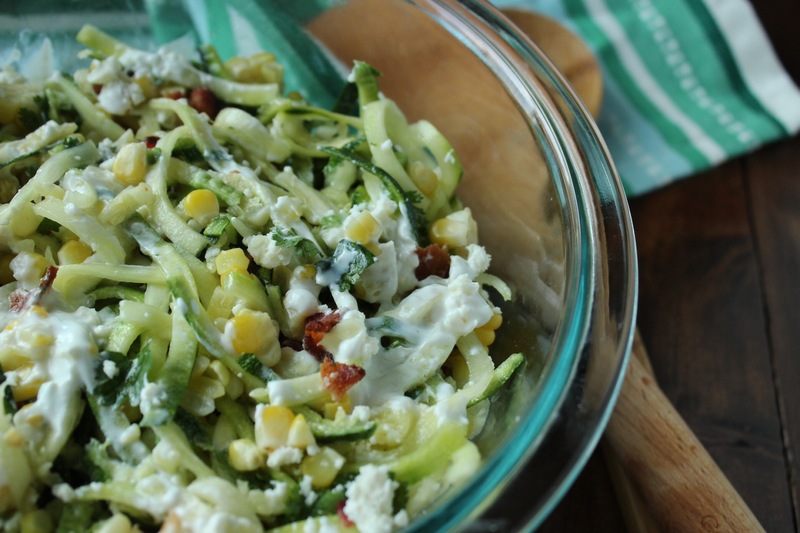 Combine sour cream and water, drizzle over zucchini mixture.